D-Day Exposed - June 6, 1944 - The website for a series of books on D-Day, June 6, 1944. Exposing myths and incompetent combat planning in this largest amphibious invasion in history. The lessons are as relevant for military strategy and battle planning today. Why did the largest "amphibious" invasion in human history fail to use any of the available armoured amphibious invasion technology being used in the Pacific war in 1944? Read the author's revision of D-Day demonstrating how the Normandy invasion could have been so different - using only what was available in 1944. What the D-Day landings should have looked like. An LVT4 invasion force in the Pacific in 1944. Amphibious LVT4 command vehicle available 1944. 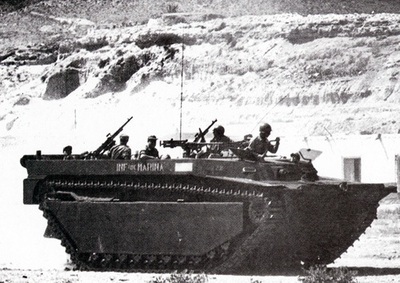 LVT4 troop carrier able to carry troops in armoured protection from sea to inland.